The flight from Melbourne is very short, and to make the most of our time we decided to arrive early in the morning. 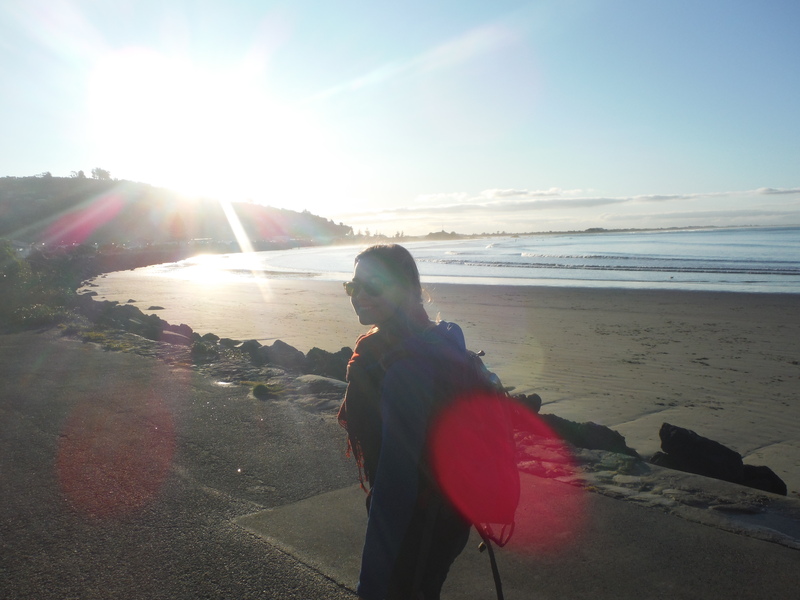 It was easy to navigate from the airport to the middle of the city via public transport. Coincidentally, we happened to be travelling on Australia Day, and even though it was early in the morning the train stations were full of people decked out in patriotic paraphernalia. I happily accepted a free Australian flag to wave around and join in the celebrations. After dropping our bags off at our hotel we set out to explore, starting at the famous King’s Cross neighborhood. This area was once known as Sydney’s red light district – and there are still plenty of seedy establishments lining the main street there. 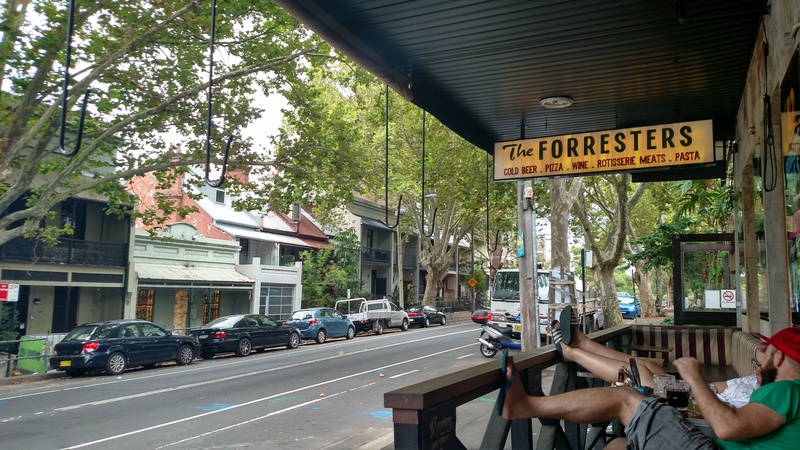 More recently known as a major party area, the Cross has undergone some pretty big changes in recent years thanks to Sydney’s controversial lock out laws. Tom actually lived in Kings Cross before the lock out laws came into effect, and it was interesting to walk around with him and listen to the stories of the area’s wilder days. Of course we had to stop for photos in front of the hostel he first landed in and the building he eventually came to call home. As the morning went on we continued our walk to the Surry Hills neighborhood. This area reminded me a lot of Melbourne in both architecture and feel. We stopped for a beer, then again for an ice cream; and this is where I had my first real Melbourne vs. Sydney revelation. Melbourne is a HUGE food city, and locals take their food seriously. Tom and I are always marveling at how harsh people are in their online ratings of Melbourne’s restaurants and bars. It seems to be pretty standard for people to have a perfectly nice meal with no complaints at all and then go on to rate the establishment a 3 out of 5 stars. As a result, anything rated above 4 stars in Melbourne tends to be phenomenally good, and a 5 star rating is really, really hard to come by. This first afternoon in Surry Hills would be the first of several times during our weekend in Sydney where Tom and I pulled out our smartphones to search for a place to eat – amazed by how many 5-star options there were – only to sit down and be majorly disappointed. I know this is supposed to be a post about Sydney, but I have to take a second here and award my much overlooked adopted Australian hometown a point: Melbourne beats Sydney bar none when it comes to food. As a result, I really don’t have a lot to say about Sydney eats other than we found it all pretty underwhelming. After our early morning and a couple of hours exploring the city, we were pretty tired and headed back to the hotel for a nap. We had booked a very exciting evening and I wanted to make sure I wasn’t too fatigued to enjoy it. 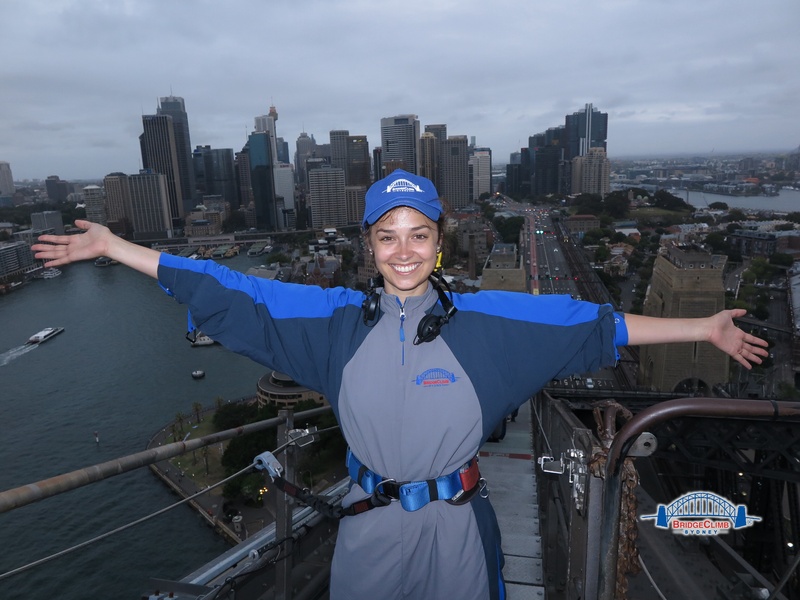 The Sydney Harbour Bridge is pretty iconic, and climbing it was uniformly suggested to me by every person who’d ever done it. Tom and I were a bit put off by the high price at first, but after doing some research and speaking to friends, we decided that it was just one of those things you have to do. I was worried that the foggy weather would cancel our climb, but tours run rain or shine – only cancelling for extreme conditions and lightening. During our orientation, they gave us all breathalyzer tests to ensure no one had been drinking, then instructed all of us to leave any earrings or hair pins behind. The guide told us that these things can fall off easily, and when falling from a great distance could injure people below. It was perhaps also for this reason that no cameras or cell phones are allowed on the climb – though they conveniently make a pretty tidy profit off selling professional photos to suckers who want to remember their experience (we were 2 of those suckers, by the way). They also gave us one-piece suits that could lock into the lines on the bridge, and hats to wear. After a quick practice on a mini bridge, we were off to do the real thing! Being as exposed as we were, I thought climbing the bridge may be a little nerve-wracking. But I was surprised by how easy it was, and how safe and secure I felt! While there were a couple of short ladders, most of the climbing was done with fairly shallow steps – always with handrails, and always buckled onto a thick safety line. We all wore headphones through which we could hear our guide giving us directions, pointing out interesting sights and details, and sharing the history of the bridge and the area. Because it was Australia Day, they also piped famous Australian music through the headphones when the guide wasn’t talking. It was pretty exhilarating to be climbing the bridge to the tunes of AC/DC and the Bees Gees! The pictures do not do the climb justice. Even though it was an overcast day, it was still pretty spectacular to see Sydney from above. Even cooler, since our tour started at 5:45, we got to see the city light up as we made our way back down. 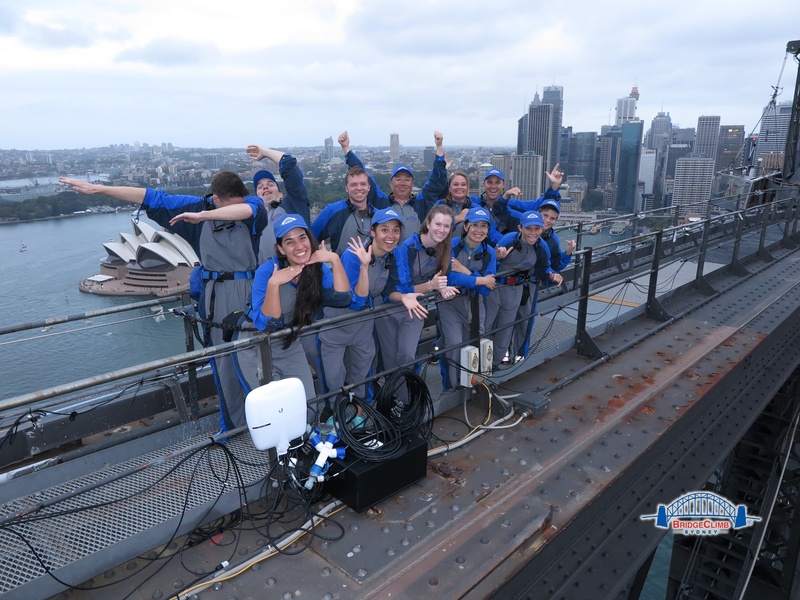 Pro Tip: ‘Twilight Tours’ of the Sydney Harbour bridge are more expensive than daytime tours. But we purchased tickets for the last tour before the Twilight Tour and got twilight anyway! After the tour we met our friend Doug for dinner in nearby Darling Harbour. It was nice to enjoy the warm Sydney weather on the water – and yes, despite my love of Melbourne I will admit that is where Sydney wins – the weather is much better there. This sounds amazing! I still have to do Sydney Harbour Bridge! Your photos are incredible!